I fell in love with the ocean while growing up in Winthrop, Massachusetts, a small New England harbor town outside of Boston. After graduating from the Art Institute of Boston, I continued post baccaulaurette study of classical painting and drawing at the Pennsylvania Academy of Fine Arts in Philadelphia. A twelve year career as an illustrator, that included a creatively-explorative period, working as a muralist, sculptor and designer followed. I focused full time on fine art oil painting in 2006, creating works for art galleries and collectors. I currently maintain a small studio space at The Button Factory artist studios in Portsmouth, New Hampshire. 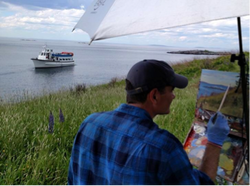 I love painting coastal New England imagery outdoors in plein air, equally as much as crafting more involved compositions in my studio. Above all, I love the process and simple joy of being with my tools and painting. My work is currently represented by ten art galleries around New England, Florida and the UK. and is in hundreds of corporate and private collections world wide, including 41st U.S. President, George H. W. Bush. I have had the good fortune to have exhibited in four Art museums and I am blessed to call this craft that I love my full-time occupation. I currently own and operate the Todd Bonita Art Gallery in both Ogunquit, Maine and Portsmouth, New Hampshire. I am also co-owner of the Ogunquit Summer School of Art where I teach painting classes and art workshops year round. I live on the New Hampshire seacoast with my wife Alison, son Max and daughter Kate. (2000 - 2003) Pennsylvania Academy of Fine Arts Post baccalaureate Study Classical Drawing and Painting. Art House Gallery, St. Ives. Cornwall, UK.